Gregor Girl members Janice Gregor and Yvonne Milton, Sandra McKandie and Elgin High School head teacher Hugh McCulloch with the donated defibrillator. Sandra McKandie and her husband Gordon, who live near Elgin, have devoted themselves to raising awareness of defibrillators since their son Keiran died after being hit by a car while cycling in March 2016. Senior secondary school pupils have already receiving CPR training from the charity Keiran’s Legacy, which was set up by the family following the accident. 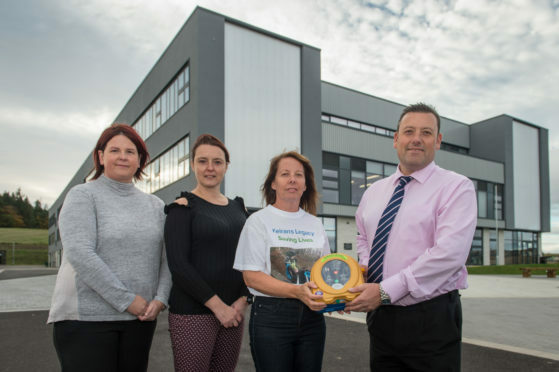 Yesterday, a defibrillator was donated to Elgin High School as the family took a step closer to ensuring that the equipment is close-to-hand for classrooms and communities across the region. Mrs McKandie said: “A huge thing that we have wanted to emphasise is the importance of making sure children are trained in actually using the equipment. “They are the future generation so we need to make sure that if they need to use them, whether in school or wherever, that they are confident. The family donated a defibrillator to Elgin Academy, where Keiran attended, in the months following the tragic accident. Talks are currently on-going with Speyside High School, Buckie High School, Keith Grammar School and Milne’s High School. Equipment is already in place at Lossiemouth High School. Fundraising group Gregor Girls donated £1,500 to Keiran’s Legacy after raising more than £12,000 at a “handbags and glad rags” event at Elgin Town Hall during the summer. Yesterday, Elgin High School head teacher Hugh McCulloch explained that students had already noticed the defibrillator box, which was installed outside the main entrance during the October holidays. Construction firm Robertson installed the bright yellow box to the school wall during the holidays free of charge.